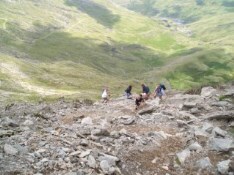 If you are moderately fit, climbing Snowdon is definitely within your reach. Out of the three highest peaks in the UK, Mount Snowdon is probably the friendliest for the Novice Walker to ascend. Apart from anything else, in the summer months there is a cafe at the top where you can get a welcome cup of tea - or a mug of soup if the weather is cold. And if you're feeling tired after the strenuous climb up you can always get the train back down. (Note: cafe is only open when the trains are running - trains run from mid May to the end of October all the way to the summit but don't run in very bad weather). There are six main routes to the summit of Snowdon - Watkin Path, Llanberis Path, Pyg Track, Miners' Track, Snowdon Ranger Path, Beddegelert Path/Rhyd Ddu. Each path is briefly described below, as well as how to get to the starting points and car park charges. The routes are fairly easy to follow particularly now that route markers have been erected. Most are fairly easy underfoot allowing many thousands of people reach the summit each year but please be aware that proper walking boots are required - you will soon start to feel every stone underfoot in trainers, and have no grip in wet weather. One route which should be avoided except by experienced mountain walkers is Crib Goch - particularly when the weather is wet or in winter. The Pyg and the Miners Tracks start at the same point. The car park here gets very full, and an early start is essential. It is not known how the Pyg Track got its name - it could be as it passes over the Pigs's Pass (Bwlch y Mocl), because it is close to the Pen y Gwryd Hotel, or because pyg, in welsh, also means pitch, and part of the surface of the path looks like black pitch. Whatever the origin, this path starts 1,170 feet above sea level which gives you a helpful start on the way. Much of this walk is rugged, and very challenging, but the scenery is interesting. You can read a description of the walk up the Miners Track and back down the Pyg Track here. This is a good walk to try if you want to walk on Snowdon but don't want to try to reach the summit as the first part is fairly gentle. The track was built during the 1800's to serve Britannia Copper Mines which were abandoned in 1917. Mine Manager Arthur Lockwood drove his car to Llyn Glaslyn, and the track to this point at the lake still resembles a road so is a good walking surface. The track does get considerably steeper towards the summit. Information for the Miners Track and Pyg Track. Both these tracks start at the Pen-y-Pass Car Park, postcode LL55 4NY. This is the most expensive car park at £10 per day, and the busiest. Arrive first thing in the morning to get a place. Information about the Brittania Copper Mine - the remains of which you will see on your walk, can be found here. 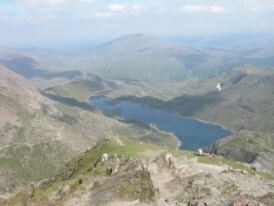 This is a hot spot for accidents on the Snowdon Massif, some of which have been fatal. At best it can be described as a scramble - at some point everyone will need to use both hands and feet to continue (there are three pinnacles to get around), and some people are so scared they need to crawl most of the way. The route starts at Pen-y-Pass, and follows the Pyg Track to a fork. The left path continues on the Pyg Track, the right path goes up to Crib Goch. Once Crib Goch is conquered the path continues to the summit of Snowdon joining the Pyg Track once again. On busy days there can be a queue of people waiting to cross Crib Goch, but don't let this fool you - it really is a dangerous route, not for the faint hearted or inexperienced. Information: The Crib Goch path starts at the Pen-y-Pass Car Park along with the Pyg and Miners Tracks - postcode LL55 4NY An introduction to this route can be found here. On most of the paths as you get close to the summit the going gets very steep. Don't give up, take it easy, and be heartened by the thought you will be able to rest in relative comfort and have a nice cup of tea or soup, a bite to eat and even buy a certificate which tells all that you have reached the top! (Although beware, train travellers can also buy these!) Remember though, the cafe is only open when the trains are running - normally mid May to October except in bad weather. Whichever route you take up the mountain, be sure to look out for markers which will show you the way down - it is easy to take a wrong path, and some are not suitable for inexperienced walkers, or those without proper climbing gear. Although many thousands of people climb Snowdon each year, it is still a mountain with steep cliffs in places, and can be very dangerous. All paths have some fairly steep parts to them, so none can be described as an easy stroll. Because of the numbers of visitors conservation work is ongoing in the mountains. Be sure to keep clear of areas where the path has been diverted to guard against erosion, and make sure you take all your rubbish home with you! Any of the walks will take you across farmland, and sheep roam freely on the mountain. If you take your dog with you it must be on a lead. 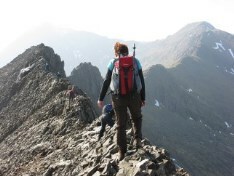 Having climbed Snowdon once, if you enjoyed the experience you can always plan to do it again, and have totally different views, by taking a different route. One of the benefits of walking on this mountain is that you do not need to go down the same way you went up. The convenient Sherpa buses travel around in the summer months between the walks, and you can catch a ride back to where you parked your car. The cost of the Sherpa bus is very reasonable, allowing you to travel around and enjoy the scenery as an alternative to driving. Once you have chosen the route you wish to take, unless you are using the bus you should aim to get to your starting point early in the morning - the car parks fill up very quickly, and you don't really want to add extra miles of road walking to your day - the ascent itself will be enough to wear you out! The postcodes of the nearest car parks and (hopefully) current parking charges are shown under the walk information below. Check the weather forecast before you start your walk, and always carry waterproofs with you even if you think the day will be fine. When you park your car on a bright sunny day you may still find yourself climbing through thick cloud as you reach the summit. The paths up Snowdon are all fairly easy to follow - just be careful that you follow the same path down from the top as you took up. Although the paths are well marked it is advisable to take a map and compass with you. Finally, remember to take warm clothing, as it will be several degrees cooler at the summit. You will be spending about 6 hours or more walking up and down Snowdon, and depending on the path you follow, will be covering between 7 and 10 miles. The Watkins path is the hardest, as on this route you will also be ascending 3,300 ft of the total 3,560 ft of the mass of Snowdon - starting only a couple of hundred feet above sea level. The Pyg and Miners tracks for comparison, start at 1,170 ft up, so although they are of similar length to the Watkins path, are less strenuous overall (although they also do have very steep parts). 3 1/2 miles long, hardest walk. Named after Sir Edward Watkin, and was originally passable to the old quarry approximately half way up by horse and cart. Opened to the public in 1892 by Gladstone, who gave a speech at what is now known as Gladstone Rock. The top part of the walk is across loose scree, and the path can be hard to follow. There are steep drops, and loose footing so take care. Being the hardest walk does mean that there is usually room in the car park as it is less popular than the others. Information: The Watkin Path starts at Pont Bethania Car Park postcode LL55 4NL. All day parking will cost £4. A full description of this walk can be found here. This is the longest, but probably one of the easiest walks. It is very popular in summer, probably as the wait for the train can be long, and people start to stroll up the path to while away the time. There is a fairly large car park here as it serves the station as well. It is not the most interesting route, but you do have great views of the trains! Information: The Llanberis Path starts at Victoria Terrace about 150 metres from the Snowdon Mountain Railway Station, postcode LL55 4TT. 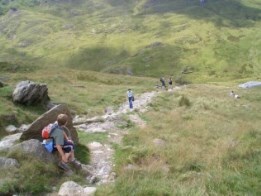 Read one couple's experience of walking the Llanberis Path here. In what is now the Youth Hostel at the start of the track lived John Morton, who used to be a guide taking walkers up Snowdon, and this path is named after him. The path is fairly easy, and has very good views. Information: The Snowdon Ranger Path is names after a mountain guide called John Morton who built the Snowdon Ranger Inn in the early 1800's. The inn is now a Youth Hostel, and the path starts at the Llyn Cwellyn Car Park near the hostel. Postcode LL54 7YS. Parking all day will cost £4. This is one of the easiest and the least used routes. It starts at the site of the South Snowdon Station of the Welsh Highland Railway. The path is easy to follow and climbs gradually to the summit. The going gets harder as you near the summit and the last section is along a steep narrow path with sheer drops below. Information: The Beddgelert Path, also known as the Rhyd Ddu Path starts at the car park adjacent to the Rhyd Ddu West Highland Railway Station, postcode LL54 6TN. All day parking is £4. Crib Goch needs a mention here, but mainly to say it is not a route for the novice walker. If you are walking with a dog, suffer from a fear of heights or are not properly equipped and not an experienced mountain walker do not attempt this route. Crib Goch is a knife edged arete. It is very exposed and should not be attempted in windy conditions at all. It has a steep vertical drop on one side, and also drops off steeply on the other side.